A book swap evening proved the perfect way to bring people together and help raise awareness of Village Friends. 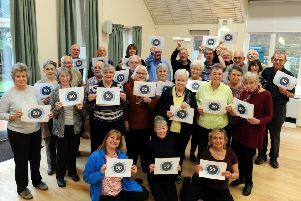 There was a good turnout at Walberton Baptist Church hall on Thursday and it proved such a success, the Village Friends have been asked to repeat it later in the year. Meg Brackley, chairman, said: “It was interesting and a lovely evening. Lots of people from the village attended, as did lots of our volunteers and a couple of our elderly village friends. The event coincided with the launch day for Rosie Howard’s new novel, A Vintage Year, and the author went along to give a short talk, sign books and answer questions from the audience. Village Friends is a good neighbour scheme for Barnham, Westergate, Eastergate, Walberton, Fontwell and Yapton. Telephone 07925217843 for more information.